HIGH The VR integration works beautifully. LOW There’s no adversarial multiplayer. WTF Why is the default camera zoomed out so far? 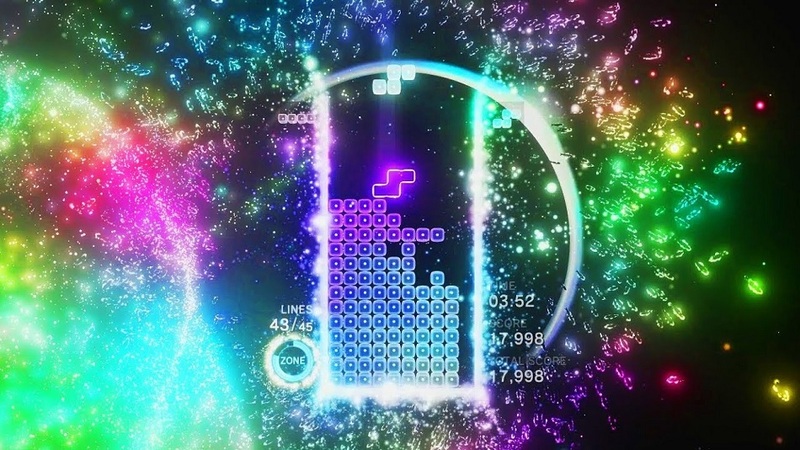 These four simple words perfectly describe Tetris Effect as the developer of Rez and Lumines brings his unmistakable brand of soaring, trippy visuals and marries them to a soundtrack that melds perfectly into the onscreen action. Before going further in a review like this, we generally explain what the game is, but I mean, really… is there anyone out there who doesn’t know what Tetris is? All right, just in case… Tetris is a puzzler where differently-shaped blocks called Tetrominos fall from the sky into a pit, and if they’re arranged neatly into lines with no gaps, they disappear and award the player some points. Over time they drop faster and faster until it becomes nearly impossible to keep up, and if the blocks stack up too high, then it’s game over. Well, that’s the core game at least. 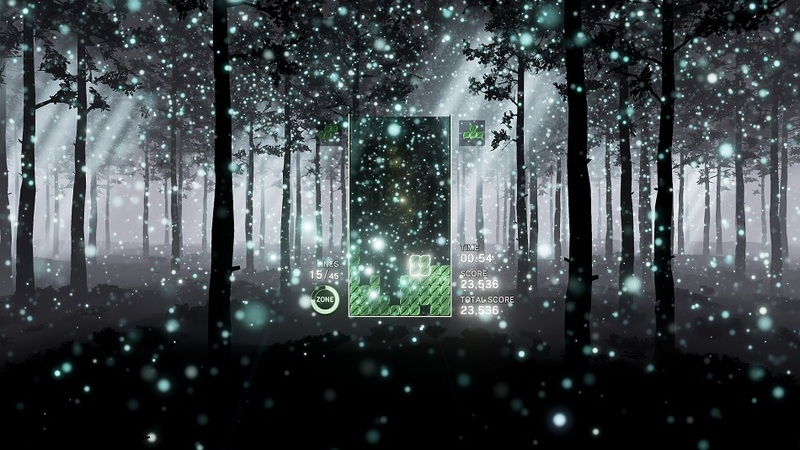 Where Tetris Effect shakes things up is in the various modes it has to offer, all uniquely themed to offer a stunning audiovisual trip. The main mode is Journey. It’s here that players will embark on a playthrough of Tetris against a backdrop of constantly-changing environments, visual styles and soundtracks. While the gameplay remains faithful to the original with just a few small tweaks, hearing soothing audio play while skimming waves alongside dolphins or being in the middle of a frenzied ritual filled with half-naked weirdos worshipping a flame certainly adds a new spin. While the diversity of biomes and sound effects means that not every arrangement will appeal to every player, it’s a seriously cool experience overall and a great introduction to the other gameplay modes available – and there’s a ton, with fifteen to start. For example, Marathon mode has players attempt to clear 150 lines whilst attaining the highest score they can on the stage of their choice. Then there’s Ultra mode, where players clear as many blocks as they can in three minutes, or Countdown mode, where players try to set it up so that a block falling from the sky in several turns will clear the lines they set up. There are a pile more, and all have their own leaderboards. Don’t expect to closely contest the best players in the world though — exceptional Tetris players are absolute savages. Possibly the most amusing one is Mystery mode — it’s a standard, vanilla game of Tetris with the quirk being that random effects will occasionally interject themselves. Ever played Tetris upside down, or have bombs and giant blocks suddenly appear on screen? It’s an interesting experience, for sure. For experts, there’s also an option to play the aptly-named Master mode where blocks streak to the bottom in nanoseconds. As a lark, I dialed the speed up to maximum and was surprised to find that I often couldn’t even move the blocks left or right before they slammed into the bottom of the pit. Clear 300 lines at that speed? Nice try, mate. On top of this, there’s an experience system for unlocking various avatars and the like. Unfortunately, EXP is only earned for games completed, which is a missed opportunity since it’s unlikely that players going for high scores will stick it out to the very end if things start going south. One of Tetris Effect‘s other selling points is the VR integration. While the devs were undoubtedly constrained by what they could realistically do given that players are essentially just playing Tetris, they’ve still managed to craft utterly engrossing virtual spaces to be absorbed into — things like flames and other particle effects swimming around in front of the player, or seeing the camera pan out to dizzying heights over a mountain range.. Even better, with the ability to choose a mode that dispenses with Tetris part of the equation, it’s possible to just relax and experience these environments without having to focus on the game. 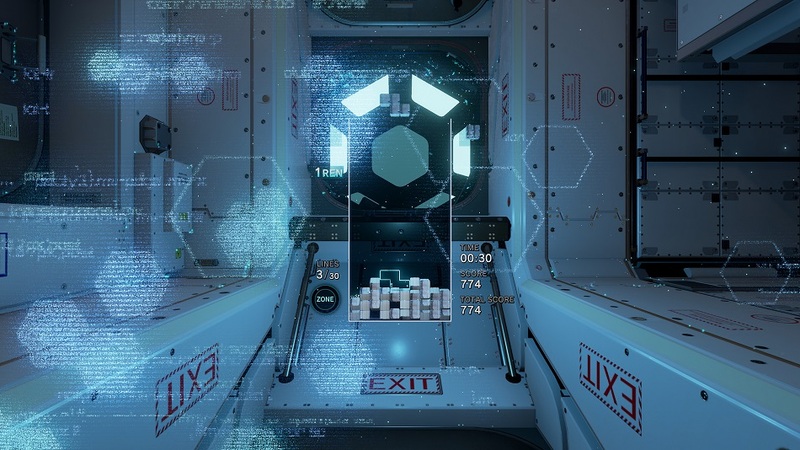 Owning a VR headset may not be required for Tetris Effect, but having played it in that manner for hours at a time, I doubt I could go back to playing it flat at this point. There are some small oversights that are disappointing, of course — there’s no ability to download replays from the best players in the world to see how they approach things, and it’s not possible to challenge others to adversarial game modes online. Allegedly this is because the developers didn’t want to introduce mechanics that could stress players out. However, I see that as a great big thundering lie considering the palpitations that occur when the fall speed goes above 10. Disclosures: This game is developed by Enhance Games and published by Sony Computer Entertainment. It is currently available on Playstation 4. This copy of the game was obtained via publisher. Approximately 12 hours of play were devoted to the single-player mode, and the game’s Journey mode was completed. There are no multiplayer modes, only online leaderboards. Parents: According to the ESRB, this game has not been rated. However, it’s Tetris. There is literally nothing here that could offend anyone other than a crazed psychopath deliberately looking for things to be offended by. Deaf & Hard of Hearing Gamers: Despite Tetris Effect‘s efforts to tie audio into the visuals, there is no actual reliance on the audio for gameplay purposes, and it should therefore be completely playable in all modes. Text cannot be resized, and is used only for menus and relevant onscreen information — see pics above. Remappable Controls: There is no single control diagram, although the controls are explained during a tutorial. Certain functions are remappable – as in, whether or not the camera is controlled with the d-pad or the left analog stick. The other buttons cannot be reconfigured. O rotates blocks clockwise, X rotates counterclockwise. Pushing down on the d-pad brings blocks down faster. Pushing up on the d-pad brings blocks down instantly. L1 or R1 will place/remove a block in a “hold” queue. L2 or R2 activates a special “zone” mode. It is criminal – CRIMINAL – that this game isn’t on PC. I mean they just FINALLY gave us Rez. I’d even take Child of Eden.